Call us today for logo shirts! 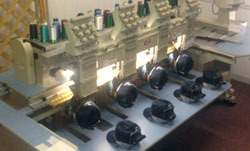 Creative Ads provides custom embroidery and screen printing services in Wilmington, NC. If you need custom jerseys & custom tshirts, we can help. Our experienced screen printers will help you find the right solution that fits your needs. We can make custom screen printed tshirts for events, fundraisers and more. If you are looking for custom jerseys for your Wilmington, NC sports team, call Creative Ads today. Show off your team logo and your sponsor on your jersey with our high-quality screen printed logo shirts. Be sure to call today and ask about our custom embroidery and screen printed t-shirts. The sports industry also uses screen printing to print souvenirs and other collectible items. T-shirts printed with the logos of popular teams, souvenirs like caps, sweatshirts, mouse pads, key chains, baseball bats and a host of many other similar items can be screen printed. Thus, screen printing has innumerous applications. Everywhere you look, you will find examples of screen printing. Let Creative Ads help you take advantage of this cost-effective method for attracting customers everywhere you go. We provide custom screen printed tshirts for a variety of events! Custom screen printed tshirts are great for a wide variety of events. Fundraisers, school events and bands regularly use custom tees to promote events and build a brand. People enjoy getting custom tshirts to support their favorite brands or a charity they are truly passionate about. Let the professionals at Creative Ads help you with all of your screen printing or custom t-shirt design needs today! If you would like more information or would like to speak with us, please feel free to call us at (910) 795-2682. We can embroider or screen print products locally, allowing for lower shipping costs, faster turnaround, and more responsive service. We can customize many of the name brand products you have grown to trust. We can design logo shirts & items with YOUR brand's logo. We can get your team outfitted ON TIME. We have a HUGE selection of shirts, warm-ups, hats, jackets, sweatshirts, key chains, shorts, gym bags, travel bags and many other team and promotional items. We offer high-quality screen printing and embroidery services. We provide professional t-shirt design services. Our professional artists can design and screen print custom t-shirts, polos, sweatshirts, and caps with your business logo or t-shirt design ideas. Our professional screen printers have designed custom t-shirts for race teams, fundraisers, booster clubs, youth camps, church choirs, marching bands, sports teams, family reunions, businesses, and more! Let our artist design custom t-shirts, sweatshirts, and polos for your high school, college, church, or business today so you can get your name out there. Call us at Creative Ads at (910) 795-2682 to get your job started! We serve Wilmington, NC and the surrounding areas. You will love our products and the service that comes with them! T-Shirts, Sweatpants, Sweatshirts, Jackets, Hats, Caps, Golf Shirts, Bags, Bumper Stickers, Huggers, Custom Screen Printing, Team Apparel, Polos, Bags, Accessories, Custom Embroidery, Warm-Ups, Team Wear, Jerseys, Shorts, Wicking Items, Athletic Wear, Printable Apparel, Gym Bags, Travel Bags.